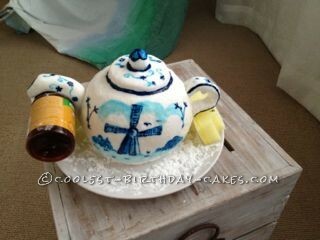 This hand painted Dutch teapot cake was created for my mother in law, who is Dutch and loves all Delft ceramics. I saw the inspiration on this site, of so many lovely teapots. Firstly I made the spout and handle out of fondant, with tooth picks sticking out where it needs to attach to the teapot. Make these a few days in advance to allow them to dry. I baked 2 cakes in tin bowls ( I find that the cakes bake quicker in tin than in glass ) and a cup cake. I placed them on top of each other forming the round teapot, with caramel in the middle and a slice of the cup cake as the lid. Next I covered the cake in a ‘crumb coat’ of butter icing. Now for the fondant. I rolled the fondant and covered the cake by placing it onto the top and slowly, patiently, smoothing it. When getting to the bottom, I used scissors to cut out triangular pieces to allow me to attach the fondant to the bottom, narrowing part of the teapot. I made sure that these joins were opposite each other where I planned to attach the handle and spout. I attached the handle and spout, propped them up with sponge and then let the teapot dry (aircon works best for this). Once dry I hand painted the ‘delft’ pattern with food coloring. I kept the supports under the handle and spout until I presented the cake. This puts the least amount of pressure on the toothpicks and icing after attaching. I hope I can inspire someone as much as I was inspired to take on this exciting project.